just having second run through lovely big new shop. Got fantastic shirts, china and tupperware and scored a free movie pass. Shop is gorgeous, and with 2 registers open checkout is quick. Ken says thanyou to everyone for their support. Pics later. 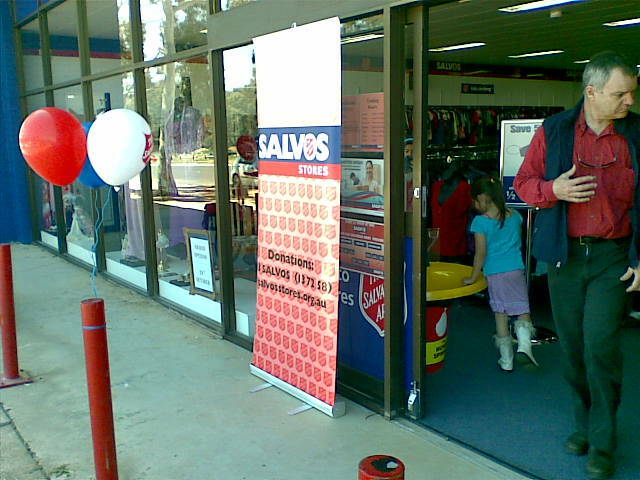 Salvos' "Furnish with a Conscience"
From Salvos' October newsletter: "Salvos Stores' exciting new campaign "Furnish with a Conscience" aims to create awareness of the social and environmental benefits of shopping at Salvos Stores. This year's campaign has been supported by interior designer & Channel 9’s homeMADE judge, Sibella Court and popular Better Homes and Gardens presenter Tara Dennis. We are encouraging consumers to use their creative flair in return for the chance to win 1 of 10 great DIY kits. 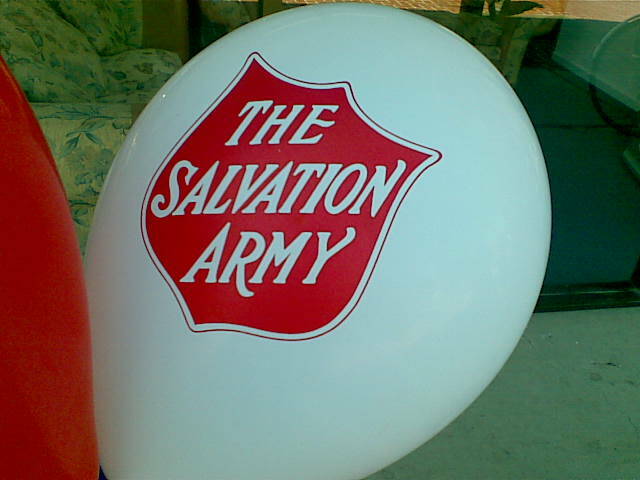 Simply go into any Salvos Store (NSW, QLD, ACT), purchase any piece of furniture, rejuvenate and send us your before and after pics for your chance to WIN! 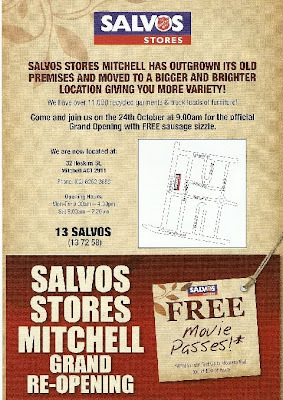 As the flier says, The new Salvos at Mitchell opens on Saturday 24 October. The new shop is just around the corner from their old location at 32 Hoskins st.
Op-shop review - Pandoras O'Connor and Hawker Coffee Op-Shop. Taph and I decided to visit a couple of smaller op-shops that live around Canberra. Our first visit was a little while ago to Pandoras in O'Connor. This little op-shop operates from a Tin shed out the back of The Anglican Church of St Phillips in O'Connor. Prices are a reasonable, but range is limited due to the size, and opening hours of the shop (currently Friday and Saturday mornings only). However they have tea and coffee available for a gold coin donation. The Other visit was to the Coffee Op-Shop that operates at the Christ-Church at Hawker (another Anglican Church). This op-shop operates between 9am and 12, on some Saturdays where they convert the back of the church into an op shop. 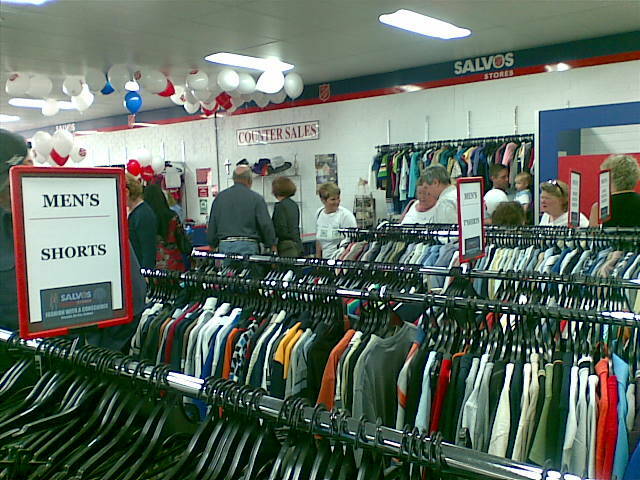 Once again, as this is a part time op shop, the range is limited and the prices are little on the high side. Their books are a little pricey, with hard covers costing $3, but paperbacks are only a $1. They also offer Tea, Coffee and cakes. We did not get a chance to try these, but the cakes they put out for another customer looked very tasty. There was not much there we wanted however with did find 2 Ripping Yarns videos, two books and a "sporran" that ended up costing us around $9 all up. 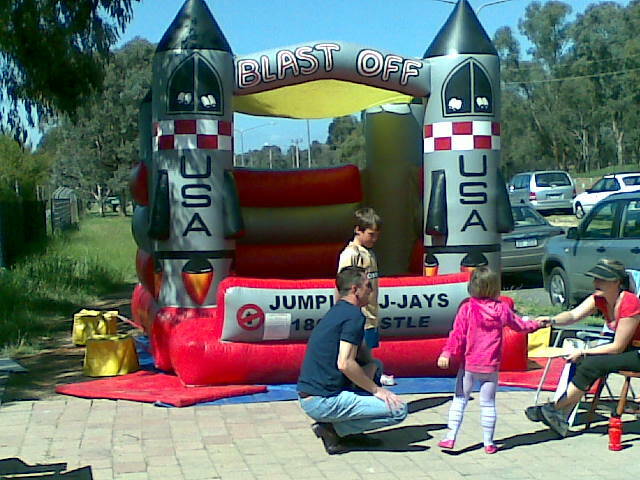 A quick day trip to Goulburn on Saturday, I had actually remembered to look up potential garage sales on Saturday night. Managed to make it to three garage sales - including one at St Andrews church, where I picked up some great haberdashery bits for between 10 and 40 cents. I also purchased a Mary Poppins book and scarf for Sage - she took them before I got to take a photo. I also purchased a box of old soft drink bottles - these are still outside, waiting to be washed. Visiting Red Cross, the Smith Family and Vinnies - my only purchase was these fabulous bowls for 50 cents each. They are in great condition - so now I will be searching for more in the setting. Rotary was having a book fair - only advertising I saw was a sign on the street. I picked up some vintage Little Golden Books and a Asterix book, for my other daughter. Did not realise it was in French until I gave it to her, oh well - another one for her collection!